Can I do a 125A subpanel feeder with slightly-larger-than-#3 wire? With all the details and data given below. So Can I do a 125A subpanel feeder with slightly-larger-than-#3 wire? This is detail directly related to the post. Question. When the 30mm^2 wire reaches 90C degrees (the red and black wire going to the aluminum terminals after main breaker in main panel). What is the temperature that can reach the terminal of the breaker? Do you think the temperature can lower to 75C at terminal or since it is cooper with maximum conduction, then temperature at terminal is also 90C? (btw the smaller wires going to the Lugs is the Siemens Whole House First Surge SPD 140,000A. I have to put this here to both protect the main panel and subpanel without increasing length). To visualize it all. 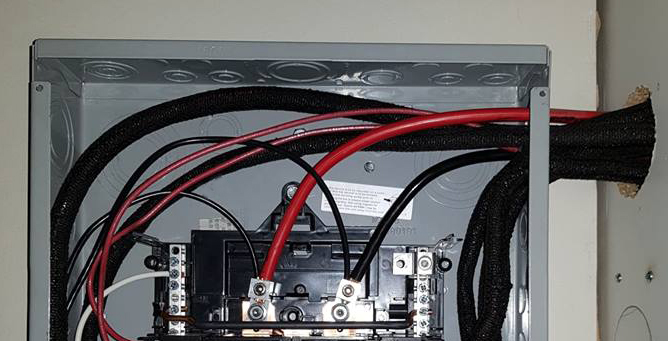 The following are complete pictures of subpanel and main panel (see related post about 6 circuits inside Raceway and possible deratement Is this 6 circuits inside a Raceway that calls for 50% deratement?) Also this thread was started by Harper who happened to directly influence me to put the subpanel first by convincing me the autotransformer can power the Siemens 2-pole GFCI breakers and I can't put them in generic brand plug in panel (thanks to him and Ed Beal who taught me and gave me guts to put the lugs on the terminal after main breaker in main panel to connect to the subpanel (with all GFCI breakers inside the subpanel)). Without them I couldn't have done it. I found out something unfortunate. 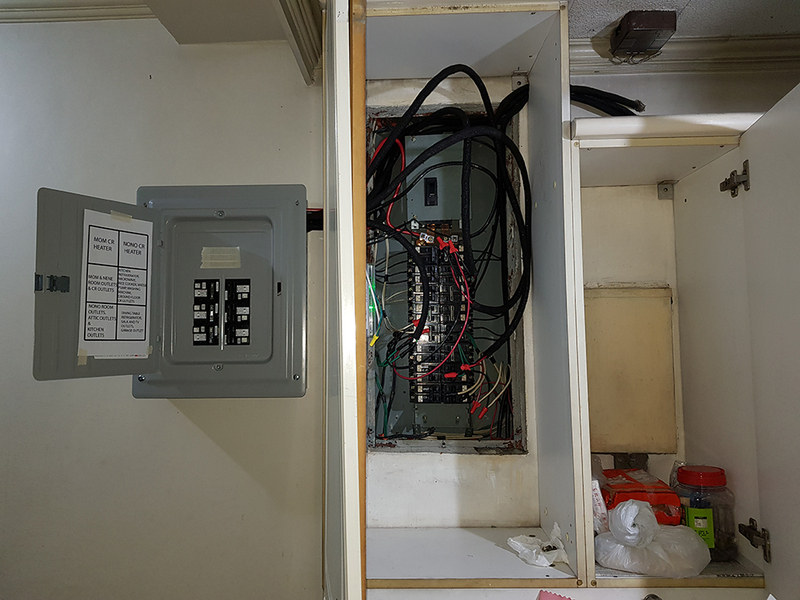 My townhouse main panel to the service entrance outside (we are 5 townhouse in compound) is about 30 meters away and it uses only 38mm^2 (between AWG 1 and 2) with 150A service entrance main breaker connected to my house 125A main panel main breaker. For 150A. It requires AWG 1/0 wire. 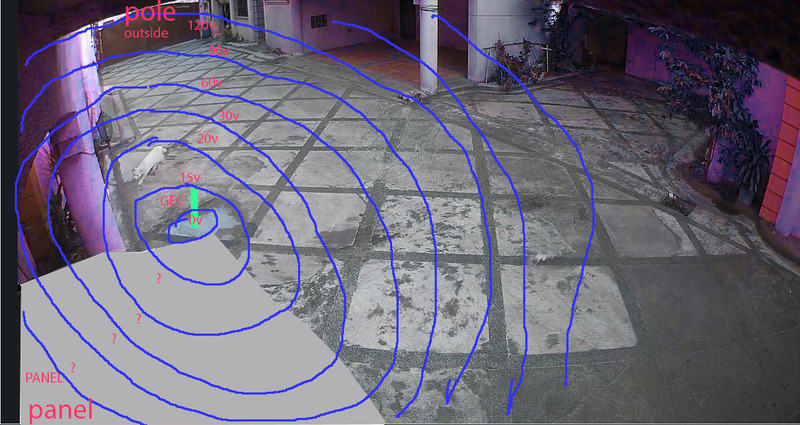 The above was file photo where I was plotting ground voltage gradient in case I'd put GEC (Ground Electrode Conductor) but difficult because have to demolish the parking (it is not possible to replace the 38mm^2 wire too because it zigzaged many unknown angles and neighbors don't want the parking demolished). So the 150A breaker will never trip because the 30 meter wire used is only 38mm^2 (AWG 1 is 42.4mm^2 for comparison). Therefore I can't use 1/0 between my subpanel and main panel inside the house because the 30 meter 38mm^2 would burn first before my planned 1/0 in subpanel, isn't it? Now if I use 38mm^2 in subpanel to main panel which at 75C is 120A. Would the 125A main breaker in house trip before my subpanel 38mm^2 wire burns or would the wire burn and the 125A main breaker tripping at same time? When a wire is listed for 120A at 75C. Does it mean at exactly 120A, the insulation would suddenly catch fire? I need to understand exactly this process so can decide whether to retain the 30mm^2 or upgrade to 38mm^2. 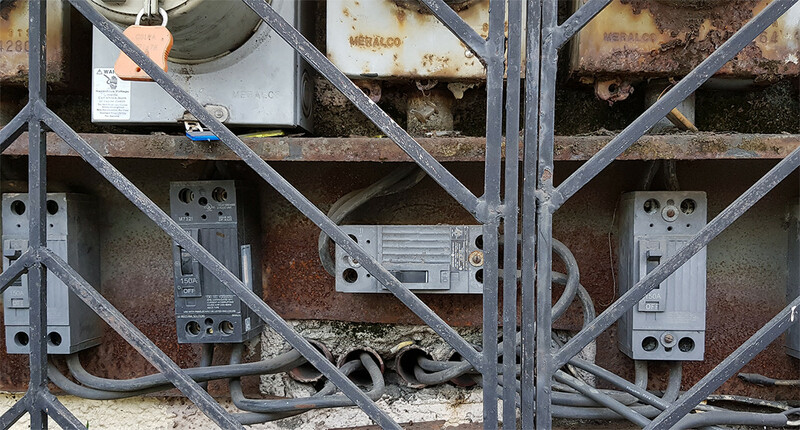 It's no longer an option for me to upgrade to 1/0 because of the 30 meter 38mm^2 between my house main panel and the compound service entrance breakers, isn't it? 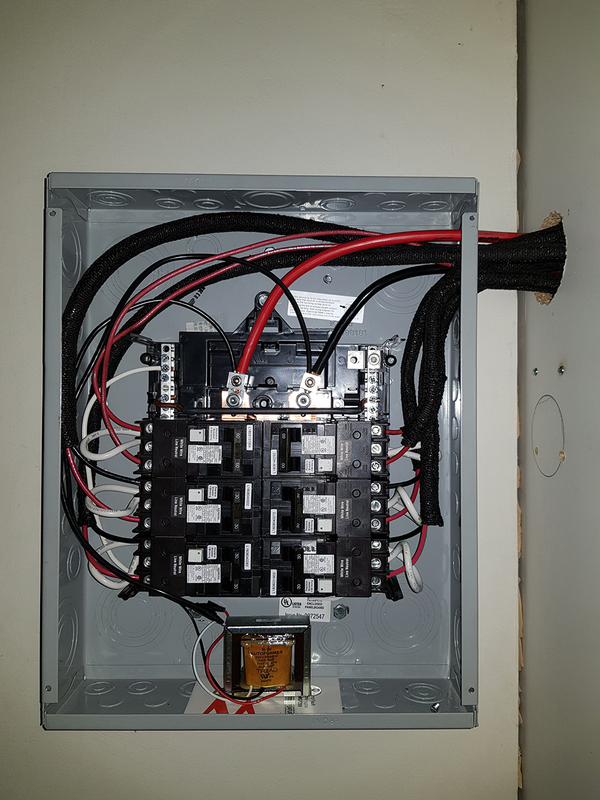 On right of it 3 inches away is the main panel (with 125A main breaker where the feeder wires are directly tapped off in the breaker terminal 1.5 inches away). The feeder wires are only 1 meter. Besides asking if 30mm^2 (between AWG 2 and 3) is sufficient. I want to know what is the biggest wire (1/0?) that you can still bend into the lugs inside the subpanel. Since it's just 1 meter wire, no problem replacing it with the biggest allowable. Note the hole to the subpanel has been grinded smooth so it won't cut the wires. No conduit is used because I couldn't find an exact 3" conduit so I inserted the load wires into black mica tube. 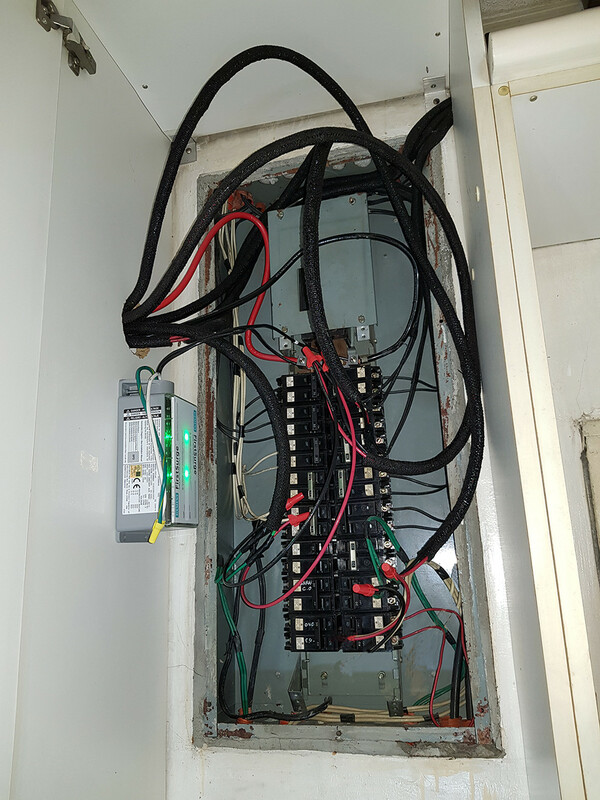 Note the load wires coming into the subpanel were taken from the main panel load. So imagine the main panel has only half of the load and half of the breakers were just turned off. Detail: The conduit length between main panel and subpanel is exactly 1 meter and connected directly to each other through hole at the sides of the panels. Initially my subpanel has a 100A main breaker (but it was defective and can't exchange it anymore). So I chose 30mm^2 to match the 100A with 125A main breaker in main panel. My mistake was not matching the wire to the 125A. So now the subpanel is Lugs only with maximum rating of 125A. So I both have subpanel and main panel that is 125A. Since 1 meter is just short. I want to change the feeder wire. Should I need 1, or 1/0 or even 2/0? Can I use 75C? I want to run a 125A feeder to a subpanel. This is actually main feed, tapped directly below (after) my main breaker which is 125A. I don't want to use another breaker in the main panel. I get an 83% uprate because it's feeder off the main service breaker. And since I am over 100A, I don't need to stick to the 60C column. I am willing to spend the money on 90C terminations if that will help. Changing lugs at both ends is possible. Also this wire being bigger than #3, does that buy me anything? Can I calculate off actual wire size rather than AWG? Phillipines but following NEC. Asking for another asker. Here's the best I am able to put together on the applicability of 30mm wire as subpanel feeder hot off a main breaker. First, the allowable ampacity of the wire. Let's look at table 310.15b16, with an added column for mm2. Assuming values are linear/proportional, and they are linear enough in such a small zone, the ? numbers are 90, 107, and 122, respectively. Because we are over 100A, we are not constrained by rule that requires us to use the 60C column for feeder. We can use the 75C or even possibly 90C column if the terminations and wire are rated for it. THHN is. Now, because this is a feeder taken straight off the main breaker, we get a derate (uprate, really) of 83% (NEC 310.15b7)The planned service is 125A. 83% of that is 104. 104 is less than 107. 30mm2 wire is adequate for this feeder. What about the outside feeder, breakered at 150A? Looking again at our modified 310.16 table, you see where the area of 38mm2 wire is dead-nuts halfway between #2 and #1. So, looking at the * numbers, we interpolate exactly halfway between. Giving 102.5, 122.5 and 137.5 respectively. Assuming we are stuck in the 75C column, we use 122.5. Being a service supply, we "derate" (uprate) 122.5 by 83% giving 147.6 amps. 147.6 amps is less than 150. But: 147.6 amp breakers are not readily available, so we are allowed to round up to the nearest available size. That being 150A. The 38mm service supply is appropriately breakered by NEC standards. You are always allowed to use larger wire than required. If Code requires #3 and you have a perfect-length scrap of #00 lying around, go for it. 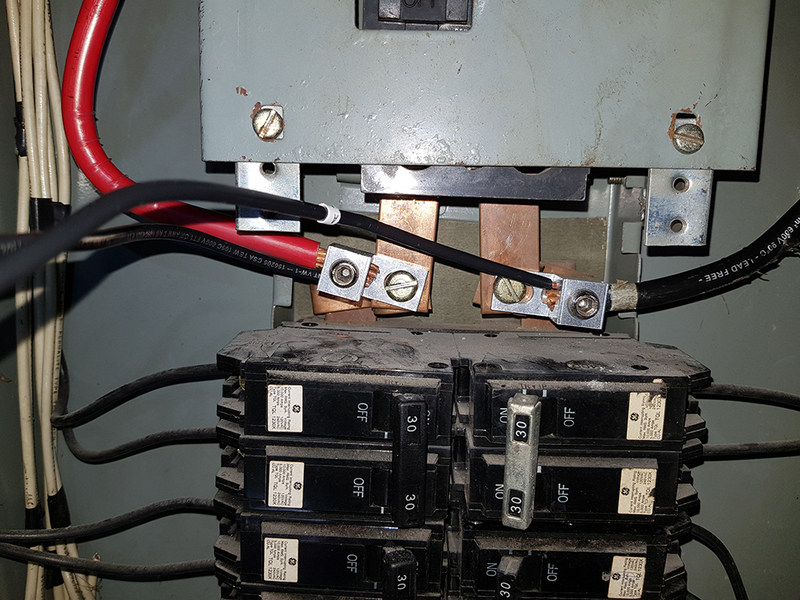 The 150A breaker should rarely trip because the very next stop downline is a 125A breaker. This is not reliable; coordination of breakers is a black art. However, if the 38mm service wires themselves developed a short, the breaker would come into play. Not the answer you're looking for? Browse other questions tagged electrical wiring electrical-panel subpanel or ask your own question. Does the subpanel feeder need to match the main breaker size? Is this 6 circuits inside a Raceway that calls for 50% deratement? Breakers protect wires.. doesn't 83% derating violate it? How to put din rail breakers/enclosure over old plug-in panel case? Can I feed 2 sub-panels off one breaker? Can I use a 150A cable to feed through a 200A breaker subpanel? How many subpanel breakers can a single piece of main breaker/bus support?